James Trevenen (1 January 1760 – 9 August 1790) was an officer in the Royal Navy and the Imperial Russian Navy. 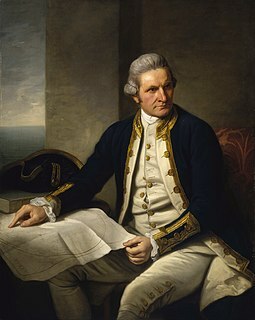 Born in Cornwall "of a very respectable family", he was educated at the Royal Naval Academy at Portsmouth and went to sea in 1776 as a midshipman on the Resolution under Captain James Cook, where he assisted Cook as a surveyor and navigator. On completing the voyage in 1780 he was promoted to lieutenant by the Earl of Sandwich, and sailed under James King, whom he had served with in Resolution, until the end of the war in 1783. Unhappy with peacetime life, Trevenen attempted to get employment from the Admiralty in 1787, but was unsuccessful. As a result, he drew up a plan for a voyage of exploration, seeking to establish a sailing route between Kamchatka and Japan and northern China. This plan was put before Catherine II of Russia, who took a strong interest in it, and promptly sent an officer to England to bring Trevenen to Russia and invite him to execute the plan. This proposed expedition is sometimes called the Mulovsky expedition. Trevenen arrived in St. Petersburg in late 1787, but the expedition's plans were disrupted by the outbreak of the Russo-Turkish War, and he was prevailed upon to take the command of a ship of the line in the Russian Navy, ranking as a post captain in the Russian service. He fought in the Baltic throughout the Russo-Swedish War, receiving several honours. At the Battle of Hoagland on 17 July 1788, he commanded the 74-gun Rodislav, and on 7 September of that year commanded a detachment of four ships of the line and five frigates which captured two coastal batteries in the Barösund Channel. At the Battle of Vyborg Bay on 4 July 1790, he acted as a commodore, but was fatally wounded by enemy fire and died on 9 August, aged 30. Laughton, J. K. (1899). "Trevenen, James (1760–1790)". Dictionary of National Biography. 57. Oxford University Press. A memoir of James Trevenen, edited by Christopher Lloyd and R.C. Anderson. Publications of the Navy Records Society, vol. 101 (London, 1959). Columbia Rediviva was a privately owned ship under the command of John Kendrick, along with Captain Robert Gray, best known for going to the Pacific Northwest for the maritime fur trade. "Rediviva" was added to her name upon a rebuilding in 1787. Since Columbia was privately owned, she did not carry the prefix designation "USS". Robert Haswell was an early American maritime fur trader to the Pacific Northwest of North America. His journals of these voyages are the main records of Captain Robert Gray's circumnavigation of the globe. Later during the Quasi-War he served as an officer in the United States Navy.